The car racing genre is probably one of the most genre that we were hoping to see talented developers visit. 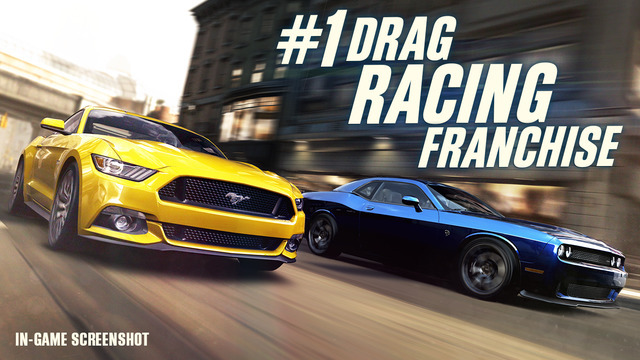 To be quite frank, we haven’t seen a proper racing game since the glorious days of Real Racing 3 & the Asphalt series. Thankfully, we now have a new competitor in this arena, so do welcome CSR Racing 2 [Free]. Being developed by the capable Natural Motion, this game sets a new standard in visuals and gameplay. With CSR Racing 2, you can now drag race in single player, compete against online players in real-time, customize your supercars, collect the most legendary of cars, and enjoy the finest visuals on a racing game. Natural Motion is a company that is well known for its 3D technological breakthroughs and you can see 3D rendering techniques implemented in the game. Even the beautiful design and detailed interior of a car can be quite noticeable in the world of CSR Racing 2. What would interest you most is the fact that you can race against friends and online players from all around the world in real-time. You know what? How about adding the fact that you can team up with friends, engage in live chats, create online crews, and join up spectacular online events. These are definitely wonderful features that we haven’t seen in a new racing game that lives up to our criteria. Of course, what is a racing game without customization features, right? The good news is that CSR Racing 2 allows you to customize your car with a wide range of paint, rims, brake calipers and interior trims. You can even upgrade it via gear ratios, tire pressure, nitrous boost settings and a lot more configurations can be possible. In this department, the game delivers a generous amount of customization possibilities. Yet what we found most interesting is the fact that you can build your dream garage. That’s right, you can collect over 50 licensed supercars that are in the game in your own warehouse garage. Just imagine having a Bugatti, Ferrari, Koenigsegg, Lamborghini, McLaren, and why not even throw in a Pagani too?! Finally, you will enjoy stunning race environments in single-player and online; CSR Racing 2 is undoubtedly the whole racing package without the flaws. You can watch the teaser trailer for this game below.